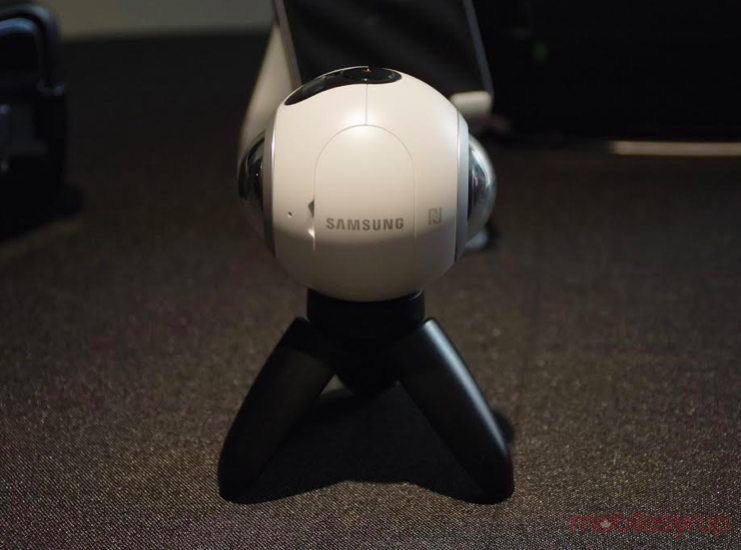 With a VR headset in tow, it was probably a foregone conclusion that Samsung would also come to market with a 360-degree camera to create content for it. Enter the Gear 360. 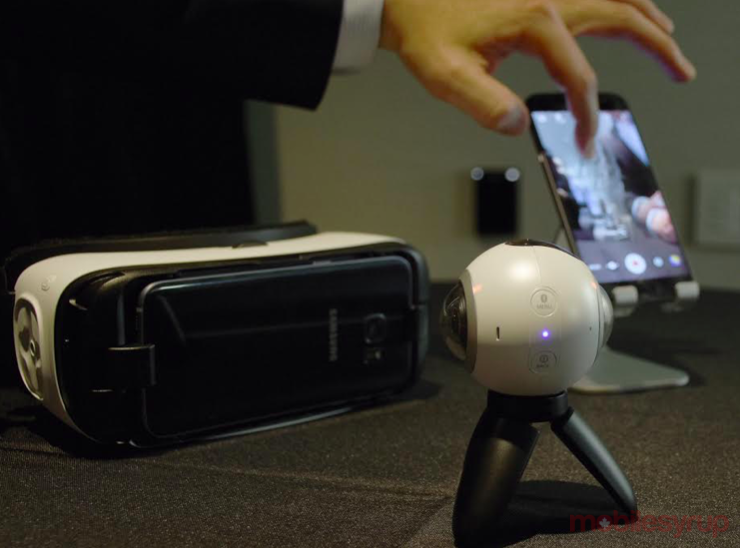 Samsung had teased a 360-degree camera at its press conference last month at CES in Las Vegas, but has now raised the curtain on a product that is coming to market in Canada, albeit at an undetermined time. 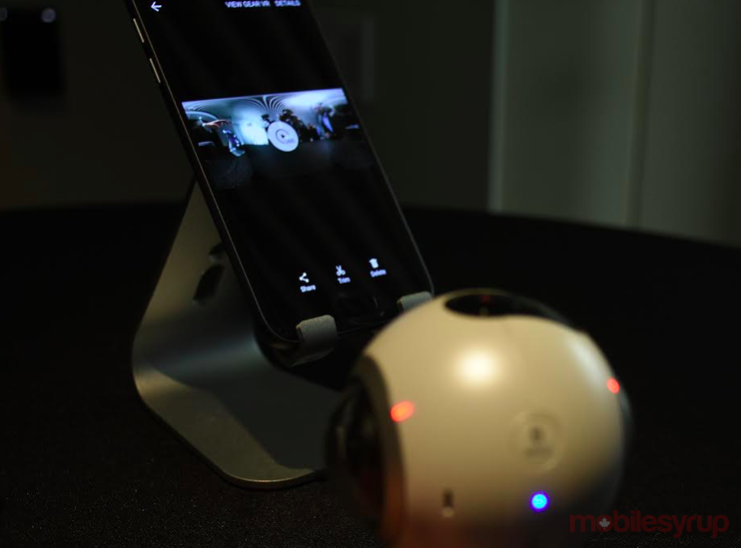 Smaller than a tennis ball, the Gear 360 takes the design language others have utilized — namely two identical lenses opposite each other — to capture two symmetrical images that can then be fused together for a single 360-degree one. That effectively sums up how the Gear 360 achieves its spherical composition. There are two fisheye lenses, each capable of shooting 4K video and 30MP still images at 195-degrees with an f/2.0 aperture for both. Initially, the two images or video clips are treated separately, only to then be stitched together automatically when transferred over to a compatible phone via Wi-Fi, which includes the Galaxy S7 and S7 edge. Samsung didn’t quantify how much processing power this fusion takes, but did confirm that PC and Mac desktop software would be made available to hand off the processing to a computer instead of having the phone do all the work — and fill up its own precious storage, in the process. 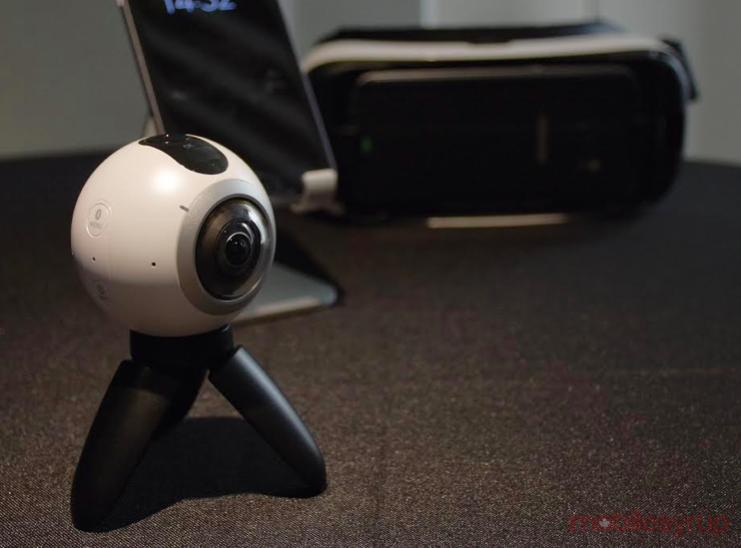 Lightweight and with a nice form factor, the Gear 360 is a neat-looking device, even if its design philosophy borrows heavily from others who have already entered the 360-degree video space, like 360fly, Luna, Panono and Toronto-based Bublcam. It will come with a protective pouch to save the lenses from undue harm, but a pocket camera, this is not. At least not like the Ricoh Theta and other upright models that can more easily be put away. The Gear 360 uses microSD to store content, lacking its own internal capacity. Up to 128GB cards are supported, and it’s unclear if a smaller capacity card will come in the box with the unit at retail. The microUSB port is standard for charging and file transfer. A trap door protects the battery pack inside, with a cover for the microUSB port. A record and stop button is at the top, along with an LED as a status indicator. 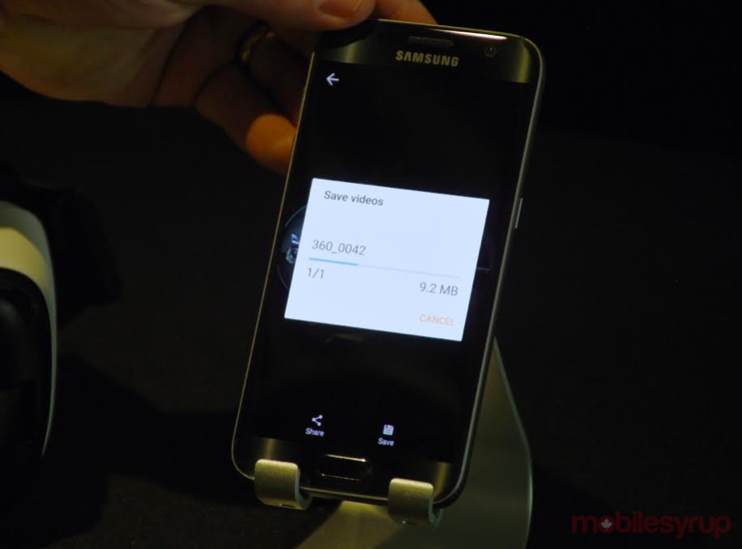 The Menu and Back buttons to the side can cycle through menus or hand off control to the paired phone. Underneath, there is the standard screw-in mount for tripods, and Samsung did showcase the Gear 360 with its own tripod to keep it propped up. Controlling the Gear VR with a paired phone is a key part of this brewing ecosystem. Much like how other action cams have utilized apps for live view, control, playback and sharing, that appears to be the primary methodology here, too. I didn’t see final software outside of some of the basic layout, and there are kinks to work out with how the Gear VR hands things off, but the general idea is to link them together as often as needed. With the content stitched together, it can then be added to a 360 library viewable in the Gear VR, or shared so that someone else with a Gear VR could view it as well. The shoot-and-transfer workflow was demoed for me and I came away impressed at how well the Galaxy S7 managed to piece it together. Granted, it was a short clip, but the lack of stuttering was good to see. Given the unique design, and the process involved in stitching the two hemispheres together, I inquired about the possibility of mounting the Gear VR on a drone upside down as a shooting scenario. It’s not clear if the software will be smart enough to know to rotate content that was shot from different orientations, but it is always a possibility that it could, I was told. Pricing wasn’t revealed at the time of this report, nor was availability, but it is safe to assume that Samsung will look to take advantage of the summer vacation season by releasing it in the spring. Canada is confirmed to get the Gear 360, though again, no word on whether the launch in the Great White North will be at the same time or later than other markets.